Starting with the full cast of presidential candidates, P.J. analyzes his way through the debates and key primaries, campaign platforms (or lack thereof), and presidential style (or lack thereof) to show us how Donald J. Trump, a man whose "haircut makes Kim Jong-un laugh," happened to America. Along the way, P.J. offers a brief history of how our insane primary process evolved and offers up some fresh ideas for a better way to choose a president (part I: road trip ). After the results are tallied, P.J. reckons with our new age: "America is experiencing a change in the nature of leadership. We're getting rid of our leaders. And we're starting at the top." And in a new epilogue for the paperback edition, P.J. 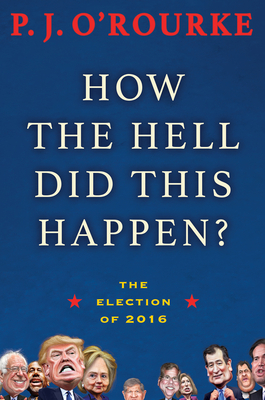 looks at Trump's first few months in office and tackles the next big question: "When the hell will this end? P. J. O'Rourke has written eighteen books on subjects as diverse as politics and cars and etiquette and economics. Parliament of Whores and Give War a Chance both reached #1 on the New York Times bestseller list. He is a contributing editor at the Weekly Standard, H. L. Mencken Research Fellow at the Cato Institute, a regular panelist on NPR's Wait Wait . . . Don't Tell Me, and editor-in-chief of the web magazine American Consequences. He lives in rural New England, as far away from the things he writes about as he can get.